Many chessplayers consider Albin's Countergambit (1.d4 d5 2.c4 e5) nothing more than a relict of romantic chess, from the era of Lasker, Alekhine, Janowski, Marshall and Keres. Even many tournament players don?t really know much more about this opening than the following nice trap with the under-promotion of a pawn into a knight: 1.d4 d5 2.c4 e5 3.dxe5 d4 4.e3 Bb4+ 5.Bd2 dxe3 6.Bxb4 exf2+ 7.Ke2 fxg1N+ with a winning position for Black. Fortunately, from time to time some world-class players are willing to revisit old openings and breathe new life into them with new ideas. Albin's Countergambit experienced a revival in 2004 when the 3rd Highest rated player in the world, Alexander Morozevich, repeatedly employed it in tournament practice with success. 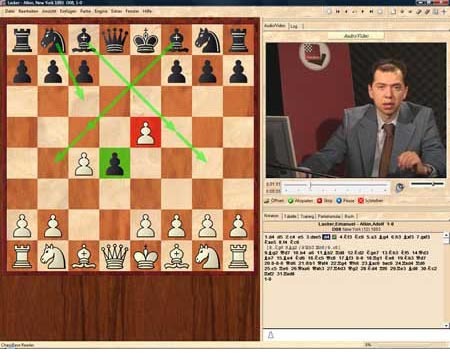 Fascinated by the possibilities of this opening, Kasimdzhanov followed Morozevich's example and presents to you all the developments in this opening over the last few years in nearly 3.5 hours of video. Rustam Kasimdzhanov. 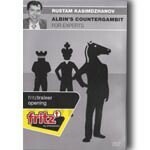 Born in 1979, the Grandmaster from Uzbekistan has for many years been known as a very strong and imaginative player. However in 2004 Rustam Kasimdzhanov shocked the chess world by winning the FIDE world chess championship title, beating a string of world-class players like Ivanchuk, Grischuk, Topalov and Adams in the process. Pentium-Processor at 300 Mhz or higher, 64 MB RAM, Windows XP, Windows Vista, DVD drive, mouse, soundcard.